Rubber nib or see-through tip? I decided to go for an option that saves me nibs and gives me accuracy! If you read my previous post, reviewing the Wacom Intuos Creative Stylus, you'll know that I love it but was unhappy about how the little rubber nibs don't last very long. I had resigned myself to having to buy more every now and then, the way I used to replenish stocks of paper, pens and paint before. I couldn't find clear step-by-step pictures of the process anywhere, so after successfully modifying my own stylus, I thought I'd post clear instructions here for the benefit of anyone looking for a similar solution. It's really quite simple. Hex3 makes a stylus called the Jaja. (I haven't used the Hex3 Jaja so can't say how it works.) Its tips are metal, teflon-coated discs that allow you to see the point at which your stylus touches the screen. If you find it difficult to be accurate with rubber nibs, you'll like this. The shaft of the Jaja tip goes into that little hole at the tip of the Wacom ICS. The hole is almost a perfect size for the shaft. The images above are only meant to show you where the hole is. The right way to fit everything is illustrated in the images below. Hex3 has also made it possible for users to buy only those teflon tips for US$14.95 a pair (they ship internationally). These in turn can be inserted into the tip of a 0.7 metal-bodied mechanical pencil, creating an instant stylus. The result doesn't have pressure sensitivity, but the following mod will give you that and accuracy. Here are the steps to modifying your Wacom Intuos Creative Stylus with a Jaja Teflon tip. Easy! 2. Position the Teflon tip shaft in the center of the Wacom rubber nib and push it through slowly, (you might want to use a torn nib so you don't need to damage a new one) then slide it it carefully into that little hole in the center. 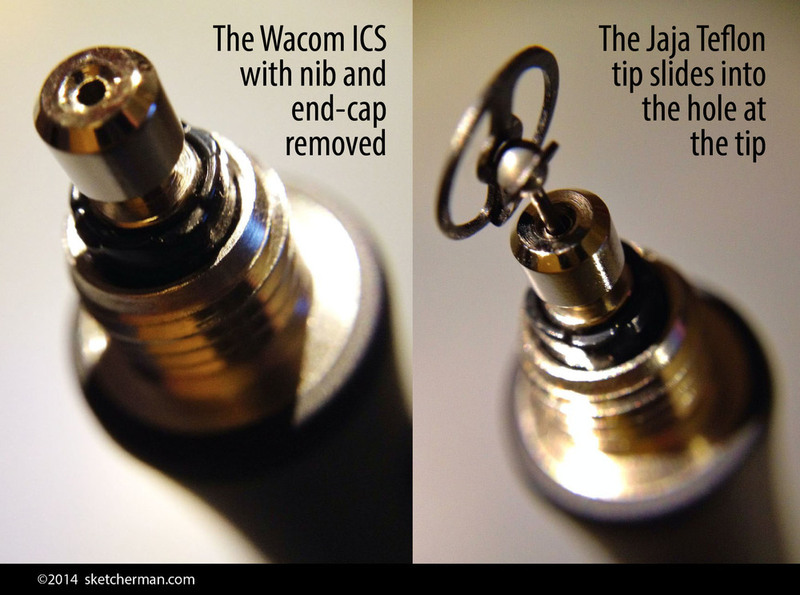 The shaft of the Jaja nib sits almost perfectly in the little hole at the tip of the Wacom ICS's metal tip. That’s it! The rubber nib holds the Teflon tip perfectly in place. Having used this solution for about a month, I have to say I'm really happy with it. When done correctly, your stylus will fit perfectly in its case, even with your new nib. How has my Wacom ICS improved? • I don't wear rubber nibs down anymore (I did buy some spares before getting the Jaja tips). • Users who've done this hack say they've been happy with this solution for months - nothing is wearing down, and I'll update this post when mine finally need replacement. • The Teflon metal tips should last for months if not longer, and your initial purchase consists of 2, so you have a spare! • And no, these tips do not scratch your iPad's screen. (The iPad's screen is made with Gorilla Glass, which is harder than most metals.) In fact, I don't use a screen protector at all. I used to think they were necessary, but read that the iPad Air's screen is extremely strong and scratch resistant. 4 months into ownership of my iPad Air, I can say it's fantastic. I will say that being careful is always a good thing. You should be aware of the environment in which you're sketching, especially outdoors. Both iPad and stylus are valuable equipment that need to be treated sensibly. Before use, check that nothing is trapped under the Teflon disk. In an environment that may be very dirty and gritty, I suggest being really careful not to get any gritty bits under the disk which might scratch the screen as you slide it across the glass. Personally, I clean my screen frequently. I often wear a glove, cut of the tips of the thumb, index and middle finger, and this cleans my screen while allowing me to rest my hand now and then. I haven't experienced any problems at all, and I've done plenty of sketching outdoors on windy days. Hope that helps and please let me know if you've tried this or have questions! I've used the Hex3 tips with my Wacom ICS for about 6 months now, and I thought I'd add an update on how things are going. 1. I've never had any tips wear out on me yet. They all glide smoothly and work great. 3. I also had another tip break when I slipped my stylus into the pocket of my cargoes, and forgot it was there. By the time I got home, the tip had also broken off. Now my stylus goes right back into it's case immediately after use, and the case rides safely in my cargoes. 4. I once lost a tip because it fell out and landed in grass. I didn't realize the tip had fallen out, and combing areas of the lawn I'd been on drew a blank. (Surprise, surprise) That issue is now solved by using a teeny bit of blue tack in the inside of the rubber nib as I insert the tip. That little bit of stickiness has prevented the tip from slipping out of place. I've been using this particular set up for a few months now: iPad Air + Procreate app + Wacom Intuos Creative Stylus. I love it. To me, it feels like technology has finally closed the gap and made sketching digitally on the go, totally seamless. Please note that when I discuss the Wacom ICS in use, I'm specifically referring to how it works with Procreate. I've tested it with other apps, and it's fine on some, but for true awesomeness, you need to try it with Procreate. Pressure sensitivity is not built into the iPad, so how well a stylus behaves really depends upon the app you use, and the ability to tweak settings to your liking. Therefore, the developer team behind your app of choice is very important. The Wacom Intuos Creative Stylus uses Bluetooth 4.0 to talk to the iPad. In other words, it's compatible with all iPads except the iPad 1 and 2. This is what you get when you order the Wacom Intuos Creative Stylus. The sleek, solid case houses the stylus itself, along with 2 extra nibs, slots for extra nibs, as well as a spot for a spare AAAA battery. • It looks great! I have the black and blue version. The metal body is slim yet solid, with a matte grippy end. Build quality feels excellent; like something that will last and last for ages. • The Wacom ICS comes in a beautiful case which gets my thumbs up. Slim and sleek, it's solid and well-built without being bulky or heavy, and has special slots for storing an extra battery and spare nibs. To protect my stylus and prevent it from accidentally being turned on, I've made it a habit to transport it in its case. • The Bluetooth 4.0 connection is fast, very lower power and for me so far, absolutely reliable. • The stylus doesn't use much power and the battery lasts for ages. After heavy usage in the last 4 months, its single AAAA battery is at 55% right now, which means I should get a few more months of use! • Most importantly, the pressure sensitivity of the Wacom ICS on my iPad Air is amazing! I literally use feather touches sometimes and they register perfectly. The ability to go from hairline to fat, juicy mark in a single stroke is creative heaven! 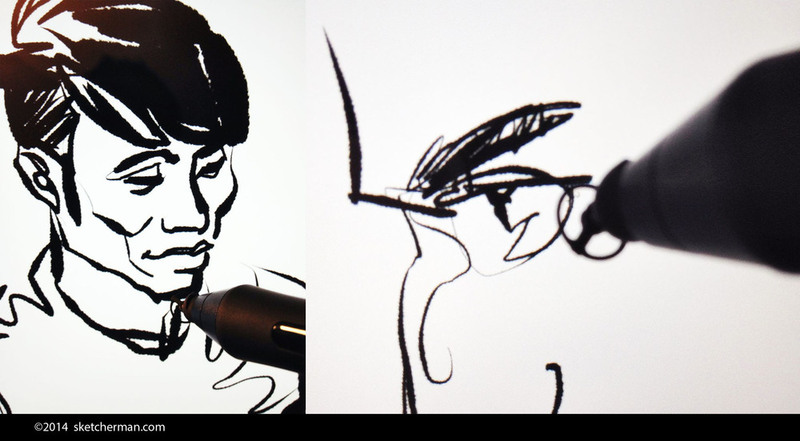 • The stylus uses a replaceable rubber nib, and comes with 2 spare soft nibs. Your mileage on those will vary greatly, depending on your style of usage and how much pressure you use when drawing. People who hate rubber-nibbled stylii because they feel these aren't sufficiently accurate may shudder at trying the Wacom ICS, but I didn't have a problem with it at all. The rubber nib is also smaller than that of other stylii, and I found a modification tip on the Procreate community forum that solves this issue very satisfactorily. Details in the this post about modifying your Wacom ICS. • The stylus is made by Wacom, so you can expect great quality and decent customer service when you need it. This may depend on where you reside though. Read on for details of my experience with Wacom customer service in the next section. • There are 2 buttons on the stylus. Some apps allow you to program them. In Procreate, I've set them to Redo and Undo. • I like to use rechargeable batteries where possible, and there aren't any rechargeable AAAA batteries available...yet. Good thing these last a long time. • No palm rejection. This is not a deal-breaker for me however, and I've taken to wearing a glove when using my stylus. This cleans my iPad's screen while I work, and let's me rest my hand on the iPad sometimes without any accidental strokes sweeping across my sketch. • My biggest concern has been that the rubber nibs that come with the Wacom a Intuos Creative Stylus tear very easily! The nib that was preinstalled lasted me maybe 3 weeks. The next one developed a tear in about one week! I'm not sure if it's a manufacturing defect or a necessary evil to get the required sensitivity. The stylus is under warranty for a year, but does not include the rubber nibs, which are categorized as 'expendable parts'. After my initial chagrin, I chalked this up to an expense on expendables; pens run out of ink, pencils get worn down and paint and paper eventually run out too, so fine. I'd need to order more now and then. At only US$4.99 for a 3-pack from the Wacom site, I thought ok, it's reasonable. When I tried to figure out exactly which nib to buy though, I couldn't find official information anywhere, which was pretty shocking! And that leads me to my next issue: customer service out of the US. • The nib issue had me most concerned as they are not currently available in Hong Kong. Down to my final one, I called Wacom Hong Kong to ask where I could get more. They were very nice, but they couldn't speak decent English, and were not at all knowledgable about the product. I had to ask my other half to speak to them in Cantonese. The ladies at Wacom HK were very apologetic, stating that this product was very new to them. I was then informed that I'd have to wait months for them to receive stock of nibs. When asked about the nib model number, Wacom Hong Kong gave me a model number that turned out to be that of the stylus! Tired of the runaround, I called Wacom USA where I was attended to quickly and efficiently. They also offered to send me one replacement nib to my US address. (Well, they said they would, but it never arrived.) The most economical solution for me was ordering via Amazon Prime in the US, getting them shipped to someone, who then sent them to me. This proved a little cheaper than buying direct from Wacom, which charges in increments of US$5 for shipping! If you've been searching the net for info about spare nibs for the Wacom Intuos Creative Stylus too, here it is! 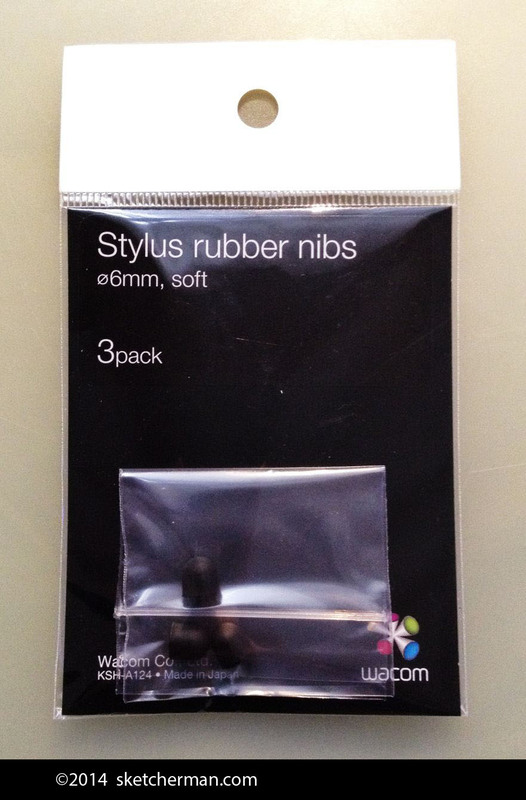 For some reason or other, neither Wacom sites nor Amazon listings say that these are the correct nibs for the Wacom Intuos Stylus. I've ordered both and can assure you they're correct however. There are 2 types of nibs: Wacom Soft Nibs (ACK20501), which are the same as the ones that came with the stylus, and Wacom Firm Nibs (ACK20601), which are an additional option. Wacom USA was sympathetic when I explained that my nibs were wearing down very quickly, then advised me to try the firm option. I ordered a set of both, and after trying soft and hard nibs, can state that I don't like the firm ones. Like many other users, I find I need to press a lot harder for my strokes to register. Maybe they require some tweaking in settings to get them to work well, but I don't want to bother with that. I spent ages getting my brushes in Procreate to work just so, and don't want to tweak any further to accommodate new nibs. The sketches above give you an idea of what's possible. Tools used: Pencil tool on the left, and Ink Bleed + Water Brush tools on the right. All of them came with Procreate, but I modified the settings to suit my preferences. So how does the stylus work? Like a dream. After you get used to the feel of rubber on glass, the process is seamless. Smooth and sensitive, I love going from thin to thick lines in one stroke. Here's a sampling of my favorite brushes in Procreate. See what I mean about thin to thick in 1 stroke? Now, after all this, you might think, "Oh this is not good! The Wacom Intuos Creative Stylus sounds great and all, but what if I need more nibs? What a hassle! Especially if I don't live in the US?" Here's the good news: there's a very easy hack to make your nibs last a LOT longer. If you haven't bought your stylus yet, you might want to read my next post before you do. No spam ever! Can't stand it and I'm sure you can't either. No spam ever! I can't stand it and you probably feel the same. Only good stuff, or you won't hear a peep from me. Promise.